In Search of the Linux Laptop. I'm shopping for a laptop to run Linux on and I'm finding it a really frustrating process. I would like a high end, small form factor machine like the Dell Studio XPS 13. I've seen one of these machines in the real life and held it in my hands. It seems to be excellent quality and have the right features at a reasonable price. Unfortunately, on the Dell Australia web site, there is no option to purchase this machine with Linux pre-installed. My current laptop is a Dell Latitude X1, and my wife has a Dell too. At work I have a Dell Precision workstation. All of these machine run Linux 100% of the time and for every single one of these machines I had to pay for a Microsoft Windows license that was never used. As most people know, Microsoft uses a small portion of its revenue to fund attacks on Linux and Free/Open Source Software like the SCO debacle and the ramming of OOXML through the ISO standards process. Considering Microsoft's malignant presence in the computer industry and the fact that I don't use their products makes me reluctant to buy a machine with Windows pre-installed. I want to buy a laptop where I get my operating system of choice and just as importantly, I know Microsoft doesn't get any part of the money I pay. Looking around for laptops with Linux pre-installed in Australia I found VG Computing who have a range of laptops which can be shipped with Linux. Unfortunately, their order page says that they get the machines with Windows which they remove to install Linux. I do realise that as a small vendor, there is not much that VG can do about this, but as far as I am concerned, thats a fail. Another company thats been around for ages is Pioneer Computers but their machines always seemed a bit old, a bit under powered and a bit over priced. Looking at that site just recently I found their DreamBook Light M73 which was close to what I was looking for. Ordering machines from Pioneer with Windows XP costs $89 more than the same machine with Ubuntu. Purchased with Linux, this is genuinely a Microsoft free machine. Taking a trip out to Pioneer in Alexandria I was able to see one up close and I must say I was disappointed. Compared to the Dell XPS 13, the DreamBook felt flimsy and poorly constructed. On top of that the DreamBook had a smaller keyboard (much like the Compaq M300 I had years ago) than than the Dell and SiS graphics whereas I was really hoping for Nvidia. Another machine crossed off the list. In the US, there are a number vendors that sell laptops with Linux. In late November 2009 I contacted two of them, System 76 and ZaReason Inc. System 76 wasn't willing to ship to Australia for warranty reasons. ZaReason will ship to Australia, but to take advantage of any warranty work, I'd have to ship the machine to and from the US which would be rather inconvenient. Despite the concerns over warranty, by early December 2009 I had come to the decision to purchase a ZaReason Alto 3550 with a bunch of extras like faster CPU, more RAM and a bigger disk. Unfortunately, while trying to purchase it online I ran afoul of their payment system and by the time we'd figured that out they had run out of stock. I contacted them and asked about the ETA for new stock. They said, Dec 19th, which came and went with no new stock on the website. I contacted them again and was told another week. A week passed with no new stock so I contacted them again when I was informed that their distributor doesn't have any more of the Alto 3550 available. I would go for the Alto 2550 but that has an Intel graphics chip whereas I was hoping for an Nvidia like in the Alto 3550. So now I have to decide, do I go with the ZaReason Alto 2550 with the Intel chip and then worry about warranty issues or do I buy the Dell locally, where I know that the support and service will be excellent and then try to get a refund for the Windows license I don't need or want. Suspend to Disk in Jaunty. I upgraded my laptop to Ubuntu 9.04 early in the beta release phase and my only disappointment with this release was that suspend to disk, which had worked so well in Hardy and Intrepid was broken in Jaunty. I even raised a Launchpad bug about it. Unfortunately it seemed that nothing was being done about this bug until another user Mathew Mueller posted a solution to the bug report. I am now a happy camper. Thanks Mathew and thanks Ubuntu. James Dumay quite liked by the old bCODE reader, but that one was a bit of an ugly ducking compared the gorgeousness of the new one. 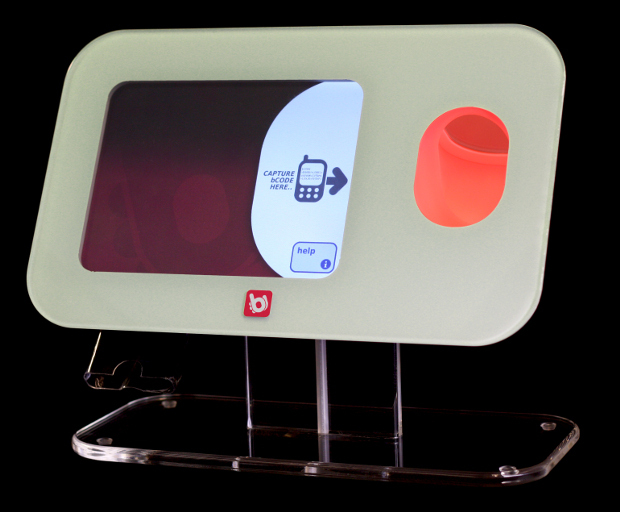 Yes people, thats a transparent perspex stand and no, this is not a mockup. This is a real photograph of a real reader. In the next couple of days we'll be shipping out about 10 of these to customers and sales people with hopefully many many more over the next couple of months. 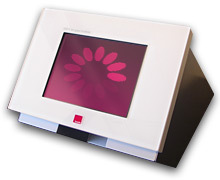 To find out what a bCODE reader does, see : www.bcode.com. Here's a neat trick I got from johnf who got it from jdub who got it from lifeless who according to him "got it from some random post a few years ago". all connections to that machine after the first will share the same initial connection. The big advantage is that for remote machines that are a little slow to log into normally, these shared connections will almost instantaneous. Johnf tells me that the one caveat is that occasionally if you shut down the first connection the others may hang and its not possible to reconnect until you manually delete the ControlPath file. Here's my pathetic attempt at keeping up with Steve Hanley, Jon Oxer and Mike Beattie. My Dell Latitude X1 laptop running Enlightenment E17 on an Ubuntu Hardy base system. The desktop background is a picture of my lovely daughter. A windows machine which is used mainly as a host for Firefox and the Tortoise SVN client. I spent the first six months in this job doing windows development. Fortunately that is all in the past. My Linux desktop system, again running E17, but on an Ubuntu Gutsy base system. One of our very cute bCODE scanners, which has just been PXE booted to a slightly modified Ubuntu Dapper installation, but before having over 100 of bCODE's own Debian packages installed on it. A second bCODE scanner running its Adobe Flash GUI on top of an Ubuntu Dapper install done by cloning a disk image. The Linux and windows machine share a keyboard and a mouse via the magic of Synergy2. The keyboard is my favourite Dell Enhanced USB Multimedia Keyboard. The one thing missing from the above photo (two separate pictures taken and stitched together by my colleague Peter) is the whiteboard which is directly behind my seat. Yes, I have my own personal whiteboard and I love it. I don't want to be accused of blogorrhea but I really need to get this off my chest. I've been a customer of People Telecom since they took over Swiftel in 2004. Since this connection is paid for by revenue generated by SecretRabbitCode I have been on one of their most expensive and highest bandwidth plans. I have been a good customer; my bills were paid by direct debit from an account that always had sufficient funds, I rarely go anywhere near my download limits and as a moderately advanced Linux user rarely, if ever, call their technical support. My father needed a new ISP so I suggested that he ring People Telecom. He made the call on the morning of Tuesday, March 25th and signed up. He was told that someone would contact him within 4 days to finalize things. On Monday March 30th, over 4 working days after the initial call he rang them again and was told that they had determined him to be a bad credit risk. Now firstly, it was just plain rude for them to have decided this and not told him and stupid for not informing him and trying to find an alternative payment solution. Secondly, my father is not a bad credit risk. He's a self funded retiree, paid off his mortgage over 15 years ago and has never had a credit card. As a credit risk, you don't get much better than this. After hearing about this, I rang People Telecom at about 10am to see if there was some way to get my father connected. After negotiating their phone robot and listening to their on-hold music I finally spoke to someone and explained the situation. They said I needed to talk the credit department and switched me though, first to listen to the on-hold music and then to voice mail. I left my details and a message asking them to call me. By 6pm that day I still hadn't received a call from the credit department so I called again, negotiated the phone robot, got transferred to the credit department, listened to the on-hold music and then got put through to voice mail. I left a second message. At around 8pm I thought I might try and contact them via their web site to try and get this sorted out. Unfortunately, their web site was down and giving SQL errors. On Tuesday April 1st at about 9:30 am, I rang again, negotiate the phone robot and got put on hold, but this time there is no music. Thinking their phone system was broken I hung up. I try again at about 10am, negotiate the phone robot and got put on hold, but again, no music so again, I hung up. I then tried again to contact them via their web site and this time it worked. Since the web mail form only allowed a limited number of characters I just asked for them to contact me and left my mobile number. By lunch time I still hadn't been contacted so I tried to ring again. I negotiated the phone robot, got put on hold, ignored the fact that there was nothing to indicate that I actually was on hold and finally got through to a person. I explained the situation briefly and the tech support guy on the other end told me I need to talk to the credit department. I explained that I've tried to talk to the credit department and they didn't return my calls. The tech support guy suggested I talk to the billing department, promises I won't get put on hold, puts me though and I go on hold. Silence. After a short period of time a woman picked up the phone and says she has read the case notes but there's not a lot she can do because its a issue with the credit department. I explain my problems with their credit department and ask to be put through to her manager. She agreed and I got put on hold again. Silence. I finally got to talk to a manager named Eric. I explain the situation, explain that I have now spent over an hour of my very valuable time and suggest that its time for People Telecom to get this sorted out. Eric, the manager suggests I put my fathers connection on my bill. I reply that this is not a good solution because my bill is a company bill, not my personal bill and having my father's bill on my company's bill would complicate accounting. I asked if it was possible to direct debit my father's account and if for some reason his account isn't paid, they bill my personal credit card as a fallback. The manager responds that their system isn't able to do this. Finally, I suggest that they need to come up with a decent solution to this or they lose me as a customer. No solution followed so I told Eric the manager that some time over the next couple of months I will be changing ISPs and then I said goodbye. Late Tuesday afternoon I received an email stating that the issue had been escalated to the Manager of the Credit Department and that I should receive a call tomorrow. By the end of Wednesday that call still hadn't come. I am dumbfounded. I simply cannot remember ever having this kind of run-around and pig-headed intransigence from any other company ever. I am now searching for a new ISP; one with something like my current 8000k down, 384k up link, about 10 gigs a month with a static IP address and reverse DNS. I am customer of yours. I own a Dell Latitude X1 laptop, my wife has an Inspiron 6400 and on my recommendation, my father bought a Dell Dimension 5150 desktop system. Dell, I think its important for you to know that none of these machines run windows. All of them run Linux exclusively and have from the day they came into our possession. However for all of these systems we had to pay money to Microsoft for operating systems we have never used. When I buy my new laptop, I would like to buy it either with Linux pre-installed or without any OS at all. Since I know Linux very, very well indeed, I do not need Dell to support Linux, just the hardware. For me as long time, devoted Linux user and developer (professionally as well as FOSS), having to pay money for a Microsoft operating system I don't use is rather offensive. Microsoft has run a long term campaign to thwart the progress of Linux and my money is being used to fund that campaign. For me, this situation in unconscionable. Apart from the not being able to buy machines without a Microsoft operating system, my experience with Dell has been very good. 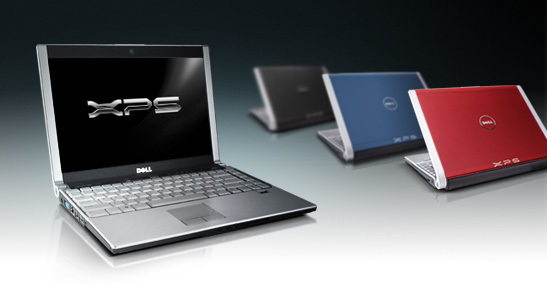 If I was able to buy a machine from Dell without a Microsoft operating system, buying from Dell would be a no-brainer. So Dell, here is my challenge for you. Offer me a good looking, high end laptop with lots of juicy options like the XPS with either Linux pre-installed or with no operating system and make sure that these options are reflected in the pricing (ie the Linux or no-OS options should be cheaper than the windows option). If you can do that you are almost guaranteed of keeping me as a customer. If not, I will be looking elsewhere for a company that can meet my requirements. If Dell loses this sale, it will likely lose other sales from my immediate family, friends and employers. Dell, the ball is in your court. Thanks for listening. Someone posted this to programming.reddit.com and it seems that if you are in the US at least, you can indeed get a Dell XPS with Ubuntu pre-installed. One good thing about the machine offered is that its got an Intel video chipset which I prefer to the Nvidia one. On the downside, its missing some of the options that I can get in the windows version like the solid state disk. I've just looked again at the Dell Austalia website and I simply cannot find a page where I can get a similar machine. So Dell Australia or Asia/Pacific, what about making Ubuntu an option for the Dell XPS available here in Australia? Telstra NextG and Sierra Wireless Aircard 875. Bus 006 Device 002: ID 1199:6820 Sierra Wireless, Inc.
Once the /dev/ttyUSB* devices are set up correctly create the files /etc/ppp/peers/telstra_aircard_875 and /etc/ppp/peers/telstra_aircard_875_chat. New file : /etc/ppp/peers/telstra_aircard_875. The username and password below need to be there but can be anything, including the exact same ones as I have here. New file : /etc/ppp/peers/telstra_aircard_875_chat The XXXX below should be replaced with the Telstra supplied PIN number that should be unique for each card. Finally, edit the file /etc/ppp/pap-secrets, and add the following entry. Again, this needs to be there, but will be the same for everyone. One of the slightly odd things about this card and Telstra's NextG network is that if the four digit PIN number isn't sent during the CHAT session the CHAT session will connect and pppd will try to negotiate an IP address but get no response, eventually timing out. Anyone who experiences this problem should first make sure that the service has been activated from the Telstra end (possibly by making sure it works under windoze) and then turn on debugging for both chat and pppd. Microsoft Executive Recommends Apple Mac. "I would buy a Mac today if I was not working at Microsoft." The rest of the email is here and more emails here. People who spend a lot of time in front of a keyboard like I do are rather particular about the keyboards they use. So much so that when I find a keyboard I like often buy two for when the first breaks down or gets damaged. I also like to have the keyboard I use at work pretty much identical to the one I use at home. The keys are all in the same place they were on all the previous keyboards I've used. It has a built in USB hub with two ports. This allows the mouse to be plugged in the keyboard so that there's really only one cable from the desk to the computer. Its rock solid and built to last. I've been pounding on the one at work for 12 months now and I'm pretty sure this keyboard will still be working flawlessly in 2 or 3 years time. Its got play/stop/pause and volume controls on the keyboard which can be set up to control XMMS or any other media player. Its USB so there are no batteries to go flat like on those stupid wireless keyboards. Recently I got a new home machine without a keyboard, so I thought it might be time to splash out on a new keyboard as well. My first port of call was the numerous computer shops on York Street in the city and the large collection of stores on George Street near Chinatown. Unfortunately, I couldn't find a single thing I liked. The keyboards on offer all seemed so flimsy or were rugged, but wireless. Trying a different approach I thought I'd try to get a keyboard like the one I have at work. I started off by searching the Dell Australia web site. The Dell web site is not particularly easy to navigate but I couldn't find it. I did however find it on the US Dell web site where even though it is listed as being available for "select Dell Latitude Notebooks" it is still possible to buy it as a separate item. It was Sunday, so I emailed the sales enquiry address at Dell Australia and asked how I would go about buying two of these keyboard. Later that day I happened to be at a shopping mall where they had one of these little Dell stands. I asked the Dell staff if it was possible to buy one of their keyboards. No, they said, I have to buy a computer to get one of these nice keyboards. I told him "the customer is always right" and slunk off to wait for a reply to my email enquiry. I waited two days for a return email from Dell sales. It never arrived so I decided to ring them. I talked to sales first and was then put through to the spare parts department where they finally took my order for two keyboards. Fifty five dollars each and free shipping. It took far more effort to get hold of than it should have but who cares, 8 days later I finally had my new keyboards. Awesome! For the last year, I have been installing Ubuntu on my machines although I kept a number of Debian machines around because I couldn't be bothered to making the Debian to Ubuntu transition. My main working machine, a Dell Latitude X1 laptop had been running Ubuntu Dapper until about 4 weeks ago. That was when I ran into a problem with Dapper. I wanted to use a recent version of a Python library (python-ctypes which was required by pyglet) and due to previous bad experiences attempting to replace part of Python I wasn't keen to try and build my own backport of the python-ctypes library. Instead I upgraded from Dapper to Ubuntu Edgy. I was well aware of the fact that Edgy is effectively an unstable version but from my experiences with Debian Unstable, I didn't expect to be hit as hard with problems as I was. First and foremost, OpenGL which was mostly working in Dapper didn't work at all in Edgy and one of the main reasons I upgraded was to use OpenGL from Python using the pyglet library. In addition, I was having a bunch of X11 stability issues and the installed version of Haskell was also a problem. So after running Ubuntu Edgy for two weeks and needing to fix the OpenGL and X11 issues, I took a look at Debian Testing and noticed that it had more recent versions of Haskell, Xorg and python-ctypes. I therefore decided to blow away the Ubuntu install and replaced it with Debian. Installing Debian on the laptop was significantly more difficult than installing Ubuntu on the same machine. I had a number of tricky problems with booting the installed kernel as well as some other problems which I think were related to the net installation crapping out due to the Debian repository being in a partially synchronised state. I did manage to work through the problems but it took time. It was when I finally had Debian running that I remembered why Ubuntu had been so easy. Post install, Ubuntu was basically ready to go, while for me, Debian requires a bunch of tweaking. The first step was to disable a number of unneeded open ports (auth, lprng, statd etc) which were never enabled under Ubuntu. Next step was get nice looking fonts by installing every damn western font package "apt-cache search" could find. Then I needed to add the debian-multimedia.org repository to get mplayer working. There are still a couple more minor issues I need to fix to get the same level of functionality I had with Ubuntu but on the whole, despite the number of hours it took to get this working and tweaked, I still think moving back to Debian was the right thing to do. Debian works for me because I'm familiar enough with the low-level nuts and bolts to make it work the way I need it to. As a developer, Ubuntu is not quite cutting edge enough, but for people like my father and my mother-in-law, I think Ubuntu is a good fit (yes, they use Ubuntu Dapper). I'll also continue to use Ubuntu for an embedded project at work where we will be sticking to Dapper until the next stable Ubuntu version is released. My Xmas Wish (for next year). Its called Kokomo. 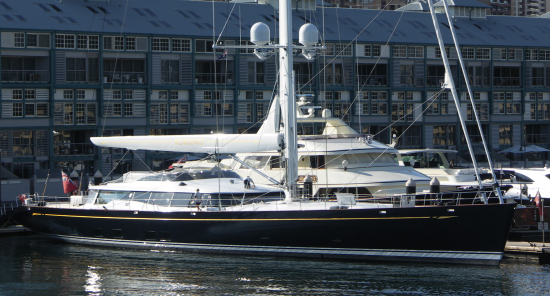 A bit of googling told me that Kokomo is 45 meters in length (yes, meters, which is about 147 feet) and the mast is 49 meters high. That is one damn nice toy. This was by far the geekiest xmas present I received this year (or any year for that matter). 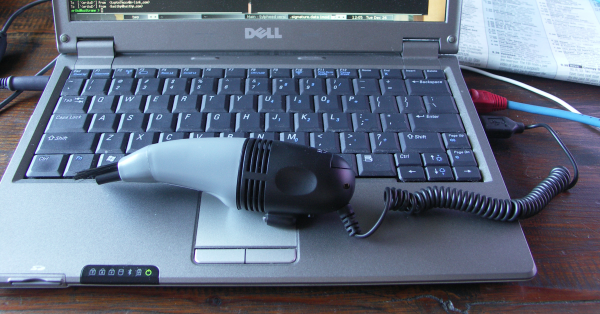 Yes people, that is a USB powered vacuum cleaner given to me by a family friend (thanks Sophie!). So, you've arranged to meets some friends after work at a bar like The Vault Hotel in Sydney's CBD. Then at 4:30 in the afternoon, whatever it is you're working on blows up in your face and you have to stay back to fix it. Bummer! So how are you going to make it up to your friends? I know, why don't you buy them a drink! With bCODE Drinks you don't even have to be at the venue to shout drinks. All you have to do is go to the bCODE Drinks web page, choose a bar (currently only about 10, but growing every week), order the drinks, enter your friend's mobile phone number and pay with a credit card. To redeem the bCODE, your friend needs to bring the SMS message up on the phone screen, make sure the screen back light is on and hold the phone under the reader. The reader takes a photo of the phone, screen scraps the text, does optical character recognition and validates against a back end server. Once validated, a message comes up on the reader screen with the number of drinks. You attract the attention of the bar tender who clears the screen and serves up your drink. If you buy your friends drinks they have to forgive you don't they? Disclaimer : I have no affiliation whatsoever with the Vault Hotel. I do however work for bCODE .